Product code: ES951 Categories: Sold Items, Sold Rings. 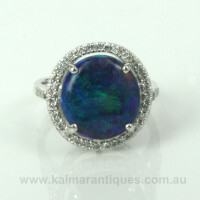 The best opals in the world come from Australia and the best opals in Australia come from Lightning Ridge and are the famous Lightning Ridge black opals, and here is a sensational Lightning Ridge black opal and diamond ring. 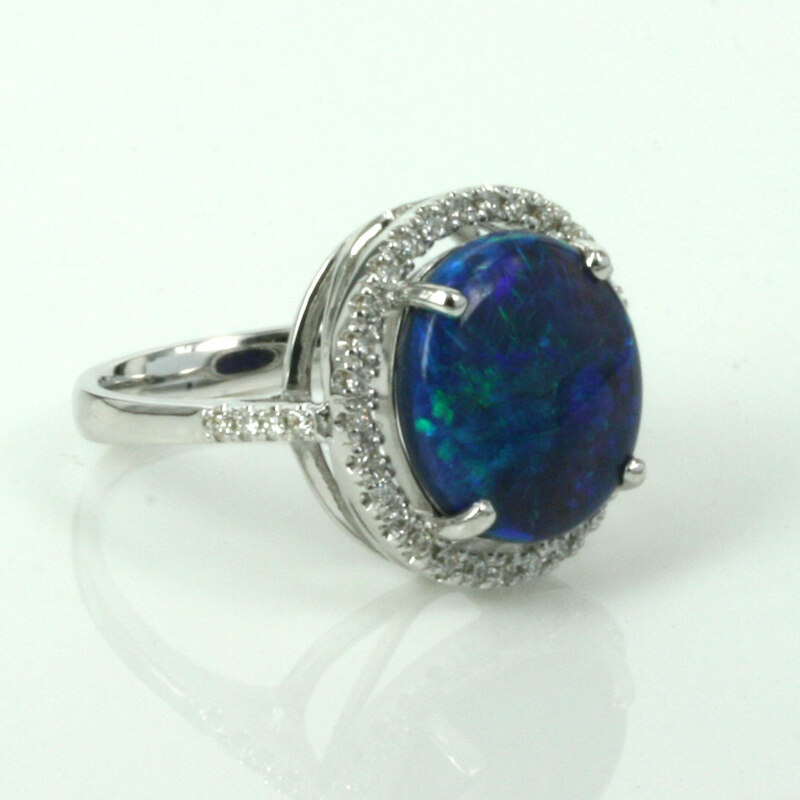 Set in 18ct white gold, the black opal measures 5.39 carats and is surrounded by 30 round brilliant cut diamonds with a further four more diamonds down each side. It is this amazing opal that is the real star of the ring and really shows why the Lightning Ridge black opal is regarded as the best of the best. The intensity of colour that comes from this ring is captivating and shows such an amazing amount of colours that will have you admiring it every single time that you put this ring on. The setting with the diamonds measures 14.08mm in diameter and the use of white gold certainly highlights the colours exhibited in this opal and the diamonds add just the right amount of sparkle to the ring without getting in the way or over shadowing the opal. Sitting so elegantly on the finger, this Lightning Ridge black opal and diamond ring is certainly an exceptional example of a fine opal and diamond ring.